A straight-edged, hand crafted Swiss comb for ultimate precision when cutting hair. Has extra fine teeth to reach every hair. Massages the scalp and evenly distributes product and essential sebum through the hair. Each Mason Pearson comb is handcrafted using traditional techniques. Unlike ordinary combs, each one is made from a single piece of material to provide completely seamless construction. The result is a comb designed to please in every way. 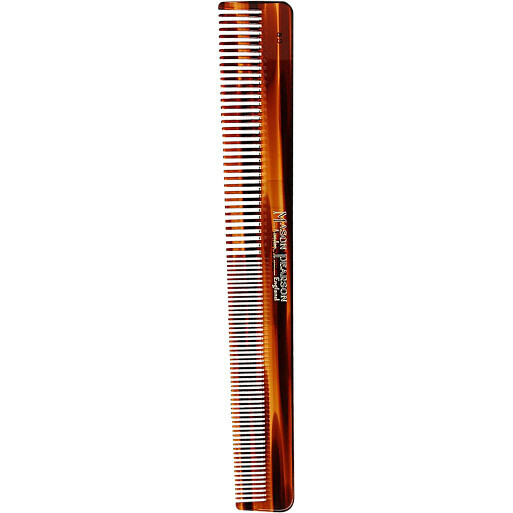 First, it pleases your eye with its graceful form and the interplay of tortoiseshell tones -- unique in each and every comb. As you pick it up, it pleases your hand with its polished surface and perfectly rounded edges. Put it to work and the polished teeth glide easily through your hair as your scalp is treated gently by the smoothly rounded ends of each tooth.